Another Successful SAIL Chemistry Camp! SAIL campers employ a variety of methods and materials to clarify a water sample during the Water Filtration Challenge. From July 25-29, 2016, the UO Chemistry and Biochemistry department hosted its third annual hands-on chemistry lab experience for twenty local high school students. The students are participants in the Summer Academy to Inspire Learning (SAIL).SAIL is a University of Oregon program led by volunteer faculty and aimed at increasing students’ enrollment and success in college. SAIL invites eligible 8th through 12th grade students to attend free, annual academic summer camps until they graduate from high school. This year’s SAIL Chemistry Camp was organized by chemistry grad students Lisa Eytel and Erik Hadland along with biology graduate student Kate Walsh. 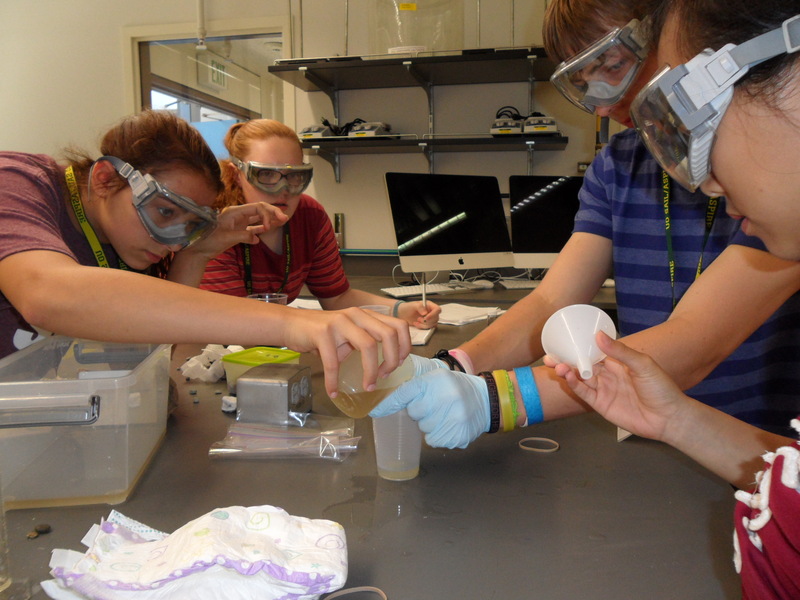 The campers, all rising freshman in high school, put on their goggles and analyzed water samples, created filters, tested the pH of of common household chemicals, designed batteries, and toured some university laboratories. Be sure to check out our photos! SAIL Chemistry Camp is sponsored by the Department of Chemistry and Biochemistry and UO Women in Graduate Sciences. Thank you! to all the additional volunteers who helped make this year’s camp a huge success: grad students Loni Kringle, Blake Tresca, Mae Voeun, Anneliese Morrison, Matt Cerda, Kathryn Chamberlain, Nicole Paterson, SAIL staffers Randi Besio and Robin Nagy, and faculty advisor Darren Johnson!